The Mining Sector in the Erongo Region has been characterised by the establishment and expansion of a number of Uranium mines over the past decade due to an increased demand for this energy source. The Erongo Region also accommodates the mining of commodities such as gold, marble, granite, salt and semi-precious stones. Mining and quarrying contributes about 8,8 percent to national GDP, 51 percent to foreign exchange earnings, of which diamonds, ores and minerals are the most important. In 2011 Namibia delivered 6.9 percent of the world’s primary produced uranium, after Kazakhstan, Canada, Australia, Russia and Niger. The uranium oxide extracted from deposits is one of Namibia’s key exports and makes the country the sixth largest exporter of uranium in the world. Namibia currently has two significant uranium mines capable of providing 10 percent of world mining output. The other mines are busy setting up their operations although some are experiencing setbacks due to the recent uranium price fluctuations. If the Uranium industry would develop as initially expected, it could employ 5,483 people, which would cause an influx to towns such as Swakopmund, Karibib and Arandis. The Rössing Uranium Mine, member of the Rio Tinto group, is one of the longest running open pit mines and produces 3,9 percent (2,148 tonnes of uranium oxide) of the world’s uranium. 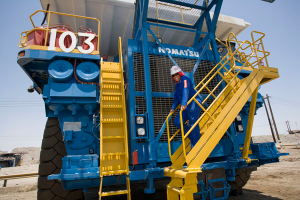 Rössing is planning to expand production up to 4,000 tonnes per annum beyond 2015 (2,000 jobs). Paladin Energy is the owner of Langer Heinrich, also a conventional open pit uranium mine. The mining and processing operation is designed to produce 2,359 tonnes per year of uranium oxide. Paladin announced at the end of 2012 that it would freeze its operations and cost cuts during the 2013/2014 financial year. AREVA Resources Namibia is a subsidiary of AREVA Resources Southern Africa. Its Trekkopje mine is planned to be an open pit mining operation. Upon commissioning, the Trekkopje Mine is expected to produce 3,000 tonnes uranium oxide per annum. AREVA announced towards the end of 2012 that it would put its developments on hold, also due to the recent price drops. Swakop Uranium is a wholly owned Namibian subsidiary of Taurus Minerals Limited, an entity owned by China Guangong Nuclear Power Company (CGNPC) and the China-Africa Development Fund. Previously owned by the Australian company Extract Resources, Swakop Uranium is responsible for developing and constructing the Husab mine. According to the company it is positioned to develop and construct the second largest uranium mine in the world with the potential to produce 15.5 million pounds (7,000 tonnes) uranium oxide per annum. Bannerman Resources owns 80 percent of the Etango Uranium Project in Namibia. Its Etango mine is expected to produce between 6 and 8 million pounds of uranium oxide per year by 2015. Forsys, which wholly owns the Valencia Uranium Project, is planning to produce 3.6 million pounds uranium oxide at its Valencia/Namibplaas uranium mine. Reptile Uranium (Pty) Ltd. Deep Yellow Limited is listed on the Australian Stocks Exchange and its operations are conducted by its wholly owned subsidiary Reptile Uranium Namibia (Pty) Ltd. Its flagship is the Omahola Project currently under Pre-Feasibility Study, with concurrent resource drill-outs on the high grade Ongolo Alaskite – MS7 trend. It is also evaluating a stand-alone project for its Tubas Sand uranium deposit, utilising physical beneficiation techniques it successfully tested in 2011. The Navachab Gold Mine is an open-pit gold mine situated near Karibib and is owned by AgloGold Ashanti. The mine employs nearly 600 people. In 2009 Navachab produced 65,000 ounces of gold at a price of U$622 per ounce. More than 85 percent of the gold occurs as native gold and the remainder as maldonite (Au2Bi). Navachab Gold Mine has the capacity to treat 1.32 million metric tonnes of ore per year. Salt is a direct product from the extraction by evaporation of seawater in natural pans or ponds. The salt works at Walvis Bay produces about 700,000 tonnes a year. 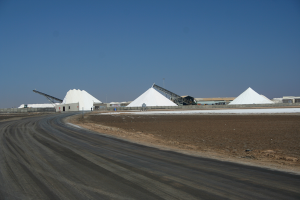 A further salt producer, just north of Swakopmund, delivers about 75,000 tonnes and at Cape Cross 30,000 tonnes per year. The bulk of the salt is exported to South Africa while West Africa is a growing market. Marble is being extracted at Karibib and processed there and at Omaruru. Most of Namibia’s marble and granite is exported in blocks to South Africa and Europe. Petroleum exploration companies have obtained the rights to drill holes along the Namibian coast. 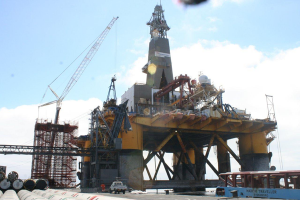 The four sedimentary basins off the coast ,that developed during the breaking up of the Gondwana continent, seem to hold the promise of oil reserves. HRT from Brazil are preparing to drill holes in two prospecting blocks on the northern fringe of the so-called Orange basin. Thus far, Chariot Oil, listed on the London Stocks Exchange, drilled two holes without success. Small-scale mining, as a sub-sector of the mining sector, provides a livelihood to a quite number of people and their dependents, alleviating poverty. It is estimated that there are about 2,000 small-scale miners in the Erongo Region, operating in cooperatives of about ten people each. These cooperatives can be found mining semi-precious stones at Omatjete, Uis, Okombahe, Omaruru, Tsubusis, Otjimbingwe, Usakos and Walvis Bay. The marketing of semi-precious gemstones such as tourmaline, quartz, topaz and tantaline and crystal specimen are undertaken at various places, along roadsides and at specially erected market at the T-junction off the Henties Bay-Usakos road. There are a number of main buyers locally and abroad. The end-buyers are tourists travelling in Namibia, especially South Africans. According to a report on small-scale mining in 2009 by Nyambe and Amunkete, during the peak tourist season between June and August, about 35 per cent of small-scale miners generated an estimated monthly income of between N$100 and N$500 from selling semi-precious stones. A further 15 per cent earned between about N$500 and N$1,000 per month while another 13,3 per cent collected more than N$10,000 per month. The biggest challenges facing the small-scale miners are the lack of financial resources, conflict over mining rights, price determination, lack of proper equipment and machinery, lack of training, mining permits, occupational health hazards. To advance small-scale mining activities in the Erongo Region, a concerted effort by government, the miners and other stakeholders is necessary.